You’ve got to love a heroine named Kate O’Sullivan. 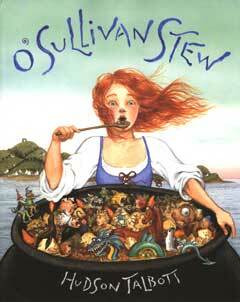 And with her daydreaming tendencies, fiery spirit and equally fiery red hair, it’s hard to resist her in Hudson Talbott’s book O’Sullivan Stew. When Kate witnesses an old hag’s horse being stolen by royal tax collectors, she tries to rally her fellow villagers who ignore her pleas. But when the hag starts causing all sorts of disaster to happen, Kate hatches a plot with her dad and brothers to steal the horse from the castle. The O’Sullivans are quickly caught and Kate must, once again, devise way out of this particular pickle. And in true Irish folklore style, Kate’s wits, determination (and stew) save the day. Talbott’s text is lively and energetic and his illustrations are vivid and lovely. This is a fun little romp through Irish folklore and a sure-fire winner in the hearts of children.